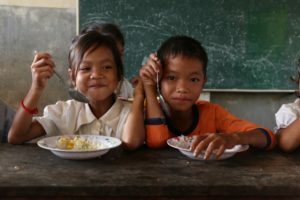 The United Nations’ World Food Program kicked off a global campaign June 19 aimed at reaching the public through a 60-second cinema spot that will air in more than 25 countries starting in September. She added that 98 percent of the WFP’s funding is from the government. “We need consumers. We need the public to know us,” said Woods, which is where the idea came from for a global cinema campaign. The “Feed Our Future” ad, which was written and directed by Sir John Hegarty’s The Garage Soho, premiered at the Cannes Lions Festival of Creativity in partnership with SAWA, the Global Cinema Advertising Association. Rather than featuring images of starving children, the ad focuses on “the potential we lose when a child dies or is malnourished,” said Woods. When she was in Congo recently, Woods said a 12-year-old boy, who looked six due to undernourishment, told her that he wants to be a footballer someday. “He’s not going to be a footballer, and his friend isn’t going to be a doctor – we’re losing potential,” she said. Hegarty said that pulling at the heartstrings works, but “we’re overwhelmed by that appeal” and the WFP wanted to go in a different direction and bring everybody into this global problem. “This affects us all – it’s not just the poor children in Africa,” he said.